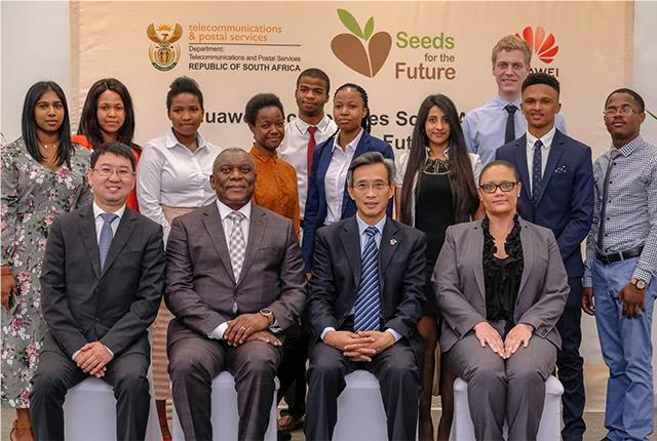 Two Computer Science Honours students from the School of Mathematics, Statistics and Computer Science (SMSCS) recently participated in the Huawei Seeds for the Future programme in China. The students, Mr Nkosenhle Duma and Ms Yuvika Singh, took part in the programme which is run by Huawei in partnership with South Africa’s Department of Telecommunications and Postal Services (DTPS). The programme offers selected third- or fourth-year students studying in information and communications technology (ICT)-related fields a two-week training and cultural experience in China. The long-term partnership between Huawei and the DTPS aims to upskill and train local ICT professionals. South Africa is one of 108 countries and regions that take part in the programme. The participants are selected based on academic excellence, demonstration of a strong interest in telecommunications and skills as a team player. Duma and Singh were awarded two of the spots among the 10 available to South African students. They were selected from a shortlist of about 60 students from tertiary institutions across the country. Singh and Duma described the experience as exceptional. At the send-off ceremony they met with the Chinese Ambassador to South Africa, Ambassador Lin Songtian, Huawei executives and the former Minister of the DTPS, Dr Siyabonga Cwele. When the students arrived in Beijing, they attended an opening ceremony where they met with the South African Ambassador to China Ms Dolana Msimang. The duo described being well received by hospitable and welcoming hosts, and they described the introduction to China’s development and infrastructure as eye opening. In Beijing, they attended Mandarin, Pinyin and traditional calligraphy classes at the Beijing Language and Culture University (BLCU). They were introduced to Chinese cuisine. Duma and Singh also visited the Great Wall of China, the Forbidden City in Beijing, Haka Village and Splendid China in Shenzen. In Shenzen, they received training at the Huawei campus where they were exposed to Huawei’s work and met with Huawei staff. Their training included a telecommunication network overview, Cloud Computing ICT technologies, the Internet of Things and 5G. The training included configuring their own 4G base stations. The students wrote an exam to test their understanding of the training, for which they received certificates. Huawei said that of the 10 students, they would select the two best students to join their company. Duma and Singh clinched the coveted positions. Professor Serestina Viriri, Academic Leader of Computer Science reflected: ‘It is a great point of joy for our Discipline, as well as for the entire SMSCS that the two students managed to secure those spots,’ he said. Viriri said this demonstrated that UKZN’s Computer Science programme is very competitive nationally, despite a severe shortage of academic staff in the Discipline. Viriri expressed his sincere gratitude to the entire Discipline of Computer Science, and the School at large for the excellent preparation of the students. Professor Delia North, the Dean and Head of SMSCS, praised the academic staff in the Discipline of Computer Science for their tireless work under difficult conditions. She highlighted the leadership of the Discipline under Viriri, who she said had ensured that the Discipline goes from strength to strength.